You’ll also need to call the airline to reserve a bassinet and bulk head seat, something I recommend you do as soon as possible after booking your tickets. Are airplane bassinets right for you? Bassinets are especially useful for lap infants. Your kid gets a comfy crib to sleep in and you’ll get to rest your arms. Call the airline before your flight to secure a bulkhead seat and bassinet. If you’d requested a bassinet, a flight attendant will install it at the wall facing your bulk head seat. This usually takes place after the seat belt sign has been turned off. Bassinets usually have a safety belt that goes across the infant’s waist when they are lying down, and you should keep that fastened during the flight. The bassinet will be taken down by a flight attendant before landing. Ask for a couple of extra blankets to line the bassinet to create a comfortable sleeping surface for your child. 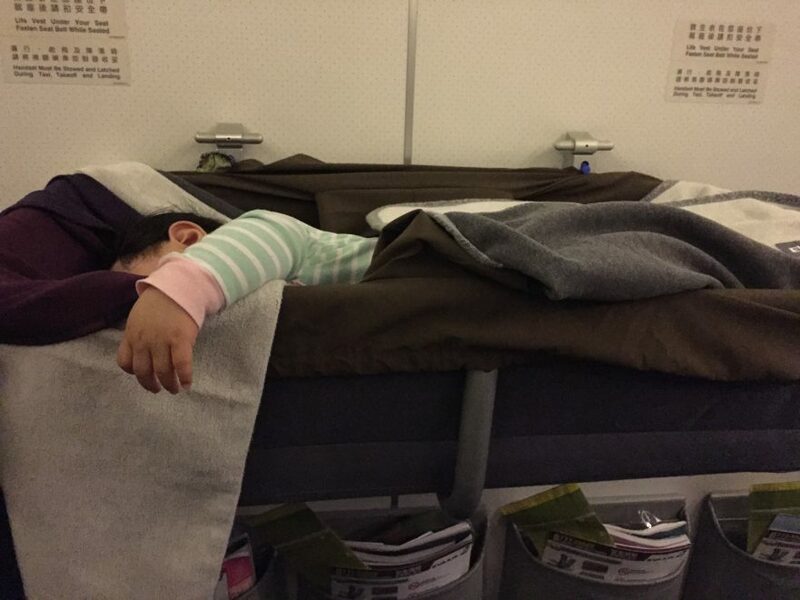 My infant, who’s never been a great sleeper on land, has always slept really well in airplane bassinets. I suspect it’s due to the coziness of the bassinet, the loud white noise generated by the jet engines and plain travel exhaustion.